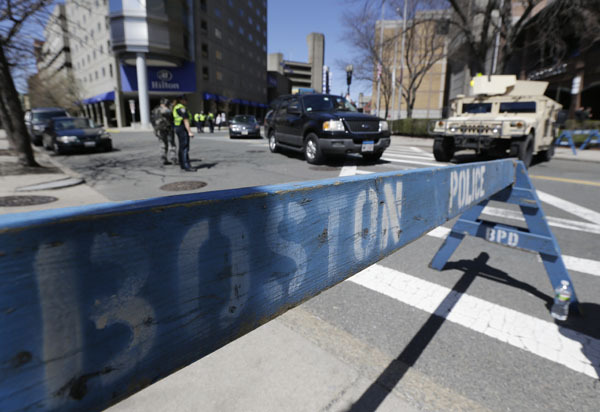 BOSTON (AP) – In what could be a major break in the Boston Marathon case, investigators are on the hunt for a man seen in a department-store surveillance video dropping off a bag at the site of the bombings, a Boston politician said Wednesday. Separately, a law enforcement official confirmed that authorities have found an image of a potential suspect but don’t know his name. The development – less than 48 hours after the attack that left three people dead and more than 170 wounded – marked a possible turning point in a case that has investigators analyzing photos and videos frame by frame for clues to who carried out the twin bombings and why. City Council President Stephen Murphy, who said he was briefed by Boston police, said investigators saw the image on surveillance footage they got from a department store near the finish line, and matched the findings with witness descriptions of someone leaving the scene. As a result, they were looking for images of someone lugging a dark, heavy bag. One department store video “has confirmed that a suspect is seen dropping a bag near the point of the second explosion and heading off,” Murphy said. A law enforcement official who spoke to AP on condition of anonymity and was not authorized to discuss the case publicly confirmed only that investigators had an image of a potential suspect whose name was not known to them and who had not been questioned. The turn of events came with Boston in a state of high excitement over conflicting reports of a breakthrough. A law enforcement official briefed on the investigation told the AP around midday that a suspect was in custody. The official, who was not authorized to divulge details of the investigation and spoke on condition of anonymity, said the suspect was expected in federal court. But the FBI and the U.S. attorney’s office in Boston said no arrests had been made. By nightfall, there was no evidence anyone was in custody. No one was brought to court. The law enforcement official, who had affirmed there was a suspect in custody even after federal officials denied it, was unable to obtain any further information or explanation. At least 14 patients remained in critical condition. Dozens of patients have been released from hospitals around the Boston area, and officials at three hospitals that treated some of the most seriously injured said they expect all their remaining patients to survive. Boston remained under a heavy security presence, and some people admitted they were nervous about moving about in public spaces. Police were stationed on street corners across downtown Boston, while National Guardsmen set up tents on the Boston Common and stationed tactical vehicles. President Barack Obama planned to visit Boston on Thursday to attend a service honoring the victims. The blasts killed 8-year-old Martin Richard of Boston and 29-year-old Krystle Campbell of Medford, Mass. The Shenyang Evening News, a state-run Chinese newspaper, identified the third victim as Lu Lingzi, a graduate student at Boston University.